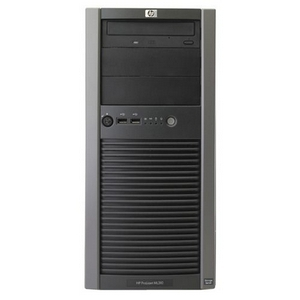 The HP ProLiant ML310 G4 Storage Server is an affordable Windows-powered file and print tower solution that enables small and remote office environments to add networked storage capacity quickly and easily. This solution can also facilitate consolidation of multiple direct-attached storage (DAS) installations and management interfaces to a single centralized Network Attached Storage (NAS) device, or it can be an effective disk-based backup or replication target. It supports multiple file sharing protocols and Windows storage-specific tools that make file share maintenance both easy and powerful. And with the optional Microsoft iSCSI Software Target, you can upgrade to host block-based storage for Exchange, SQL or other applications.